We also carry out platings on components made of carbide metal or high-melting metals and their alloys, for example: molybdenum blanks, molybdenum pins, sintered tungsten parts, tools made of tungsten alloys, wolfram needles, parts made of titanium, niobium, tantalum and their alloys. Besides a special galvanic plating, the subsequent annealing in an inert atmosphere imparts new qualities to the components. 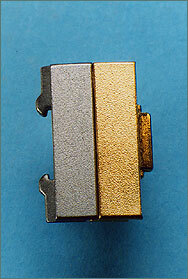 Nickel or gold platings facilitate further processing, in particular soldering. This is because the metal platings applied by us act as so-called adhesive bridges, so that the plated component can no longer oxidize. 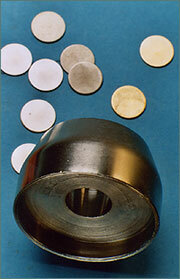 Precious-metal platings for purely decorative purposes are also possible. Prices for individual items or small series on request.